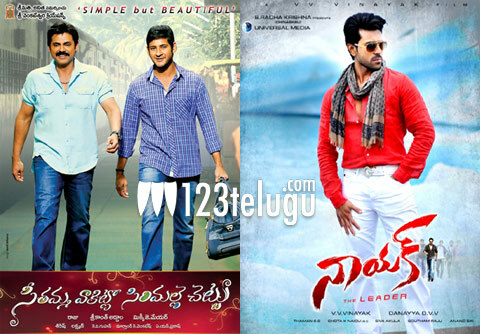 Two biggies will fight it out at the Box Office this Sankranthi. While one is the prestigious multistarrer ‘Seethamma Vakitlo Sirimalle Chettu’, the other one is the mass entertainer ‘Naayak’. Both the films have a big budget and are carrying a lot of buzz. As per the talk currently doing the rounds in Filmnagar, both the films are aiming for a record release in Hyderabad. Dil Raju is the Nizam distributor of both the projects and he also happens to be the producer of SVSC. Since the films have a couple of days gap between their scheduled releases, Dil Raju is reportedly ensuring that both films get maximum possible screens for Day 1. The record for maximum no of Day 1 screens in Hyderabad is currently held by Pawan Kalyan’s ‘CMGR’. Looks like this figure will be under tremendous pressure this festive season.